Home » Our Doctors » Alexander Carpenter, O.D. 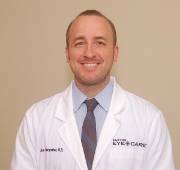 I’m excited to be returning to Easton Eye Care as a recently graduated Doctor of Optometry. I grew up on the Eastern Shore and look forward to providing comprehensive eye care for the community that helped shape me. I am pleased to join a team that I know can meet your eye care and eyewear needs in a friendly and professional manner. I received my Bachelor’s Degree in Biological Sciences from the University of Maryland College Park. Shortly thereafter I began my career path by joining Easton Eye Care as an optometric technician where I got an impressive firsthand look into the profession. I received my doctoral training at the Pennsylvania College of Optometry, where I was also fortunate enough to complete an externship with the Allentown Veterans Affairs Hospital. I am excited to begin my professional career and work hand-in-hand with local providers and organizations to improve patient access to quality health care. Professional interests include ocular disease in relation to systemic health and binocular vision disorders.